New book, 304 pages. 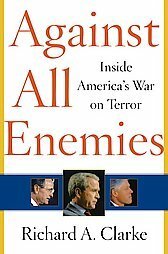 "The bush administration has squandered the opportunity to eliminate al Qaeda.." No one has more authority to make that claim than Richard Clarke, the former counterterrorism czar for both Bill Clinton, and George W. Bush. The one person who knows more about Osama Bin Laden and al Queda than anyone else in the country, he has devoted two decades of his professional life to combating terrorism. Richard Clarke served seven presidents and worked inside the White House until he resigned in 2003. He knows, better than anyone, the hidden successes and failures of the Clinton years. He know, better than anyone, why we failed to prevent 9/11. He knows, better than anyone, the hidden successes and failures of the Clinton years. He knows, better than anyone, how President Bush reacted to the attack and what happened behind the scenes in the days that followed. He knows whether or not Iraq presented a terrorist threat to the United States and whether ther were hidden costs to the invasion of that country. This item was added to our catalog on Saturday 14 July, 2007.